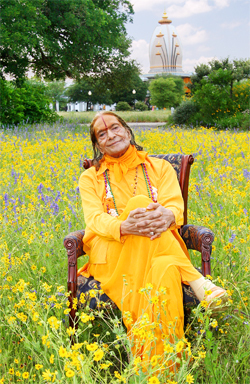 Maharaji Kripalu says that the Bhakti Shatak is the gem of the knowledge of the Upnishads, Gita and the Brahm Sutra called prasthan trayi which has been consolidated into one hundred couplets along with the devotional theme of the Bhagwatam which is proclaimed as the final authority on the spiritual matters by the Vaishnav acharyas and also Shree Chaitanya Mahaprabhuji. Shree Maharajji has himself delineated the meanings of these couplets, and detailed the devotional philosophy contained in it. Thus, it becomes a most valuable asset for the devotees of Radha Krishn. These couplets describe the complete philosophy of soul, maya, God and the realization of Krishn love. The forms of one single God, which are described in the Upnishads and the Puranas in many ways, are explained in these couplets in a very convincing manner. Ved Vyas defines that supreme God Krishn has His three Divine forms which are called brahm, paramatma and bhagwan. Brahm is such an aspect of God where all the virtues and powers of (sachchidanand) God remain absolutely dormant. So, it is called nirgun nirakar brahm. The form of God where the absolute Blissfulness of His Divine ‘name,’ ‘form’ and ‘abode’ is revealed is called paramatma (which is the supreme Almighty power of God, and its related Divine abode is called Vaikunth). Divine Vrindaban abode is the personal glory of Shree Raseshwari Radha Rani’s supreme absoluteness. Substantially, the absolute sweetness of Krishn love resides in the intoxicating absoluteness of Radha’s love, called madan mahabhao by Roop Goswami (Ujjwal Neelamani, 14/219). So it is said that Radha’s other form is Krishn, and thus, They are Both one. The human mind and the world, both are the creations of maya. This is the reason that the worldly things and worldly attachments are always pleasing and appealing to the mind. The mayic energy is extremely potent. Without the Grace of Krishn its effects on the mind can never be reduced or removed, and that Grace (according to the Gita) is received by selflessly surrendering to Krishn. There are several ways and styles of doing spiritual practice, e.g. doing good karmas, studying vedant, doing yog or austerities etc. But, all of them, without the true loving devotion (bhakti) to God, are in vain like a body without a soul. So, a person should do his devotions with true longing for God under the guidance of a Divine personality and fully purify his heart. Then, with the Grace of his Divine Spiritual Master he will receive God realization. If his Spiritual Master is a true rasik Saint only then he will receive the true Divine love of Krishn.